About Nowy Swiat in Warsaw Poland with video and maps. Nowy Swiat is one of the most beautiful streets in the Warsaw Centrum. It is popular among tourists and it is a favored meeting place for Polish people. 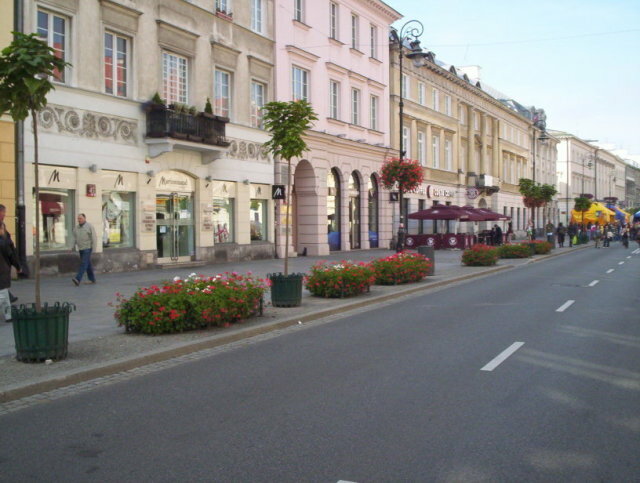 Nowy Swiat is lined with coffee shops, restaurants and upscale shops of all types. It is one of those places that you just go to find one of the outdoor cafes and relax. The walkways are wide and make for a pleasant walk. Traffic is limited and no passenger cars may use the street without special permit. On weekends, it is often closed to all traffic so that concerts, fairs and expositions can be set up in the middle of the street. As you walk down Nowy Swiat from Al. Jerozolimskie and head toward the Old Town, you will pass from Nowy Swiat to Krakowskie Przedmiescie, another beautiful and interesting street. Walking these two streets should be on your list of things to do in Warsaw. If you are interested in more small shops with interesting product, be sure to take some time to walk Chmielna. You will see it on the left as you head to the Old Town. It looks like an alley way. It is likely to be well worth your time. Look at the map below this video to get oriented. Here is a link to a map showing Nowy Swiat. We do hope that this Warsaw Poland Nowy Swiat page has helped.